I don’t know about you but I’m so sick of candy. As soon as a holiday is over I’m anxious to get it out of the house. That’s a problem with holidays like Easter because even if you did a lot of pre-holiday goodies the actual day brings in a pile of sugar. This recipe was my remedy to get it out of the house. I made brownies and added a WHOLE lot of chocolate candy to the batter. This is actually a recipe for Texas sheet cake. My dear friend Beth gave this recipe to me 11 years ago and it quickly became a favorite of mine. You can’t go wrong with it. Since I added a pile of candy to the batter I only used half of the glaze on top. If you use the whole glaze it will completely cover the sheet cake. I love how it oozed into the gaps that the candy created. Mmmmm. I hope your family enjoys this recipe as much as we do. With or without the chocolate candy added to the batter it is a fabulous way to whip up a crowd-pleasing brownie. It has a cakey feel to it and the glaze hardens up just enough to seal in the moisture. This brownie gets better the next day if you can believe it! Enjoy! Preheat oven to 400 and grease a 17x11 jelly roll pan (or large baking sheet with a rim). In the bowl of your mixer combine flour and sugar. In a heavy saucepan combine butter, shortening, coffee or water, and cocoa powder. Stir and heat to boiling. Pour boiling mixture over the flour/sugar mixture. Add the rest of the ingredients. Mix well. Pour into prepared pan. Place chocolate throughout the pan and bake at 400 for 20 minutes. While the brownies bake prepare frosting. In a saucepan combine butter, cocoa powder, and milk. Heat to boiling, stirring. Mix in the powdered sugar and vanilla until the glaze is smooth. Remove from heat. Pour warm frosting over brownies as soon as you take them out of the oven. Cool and serve. 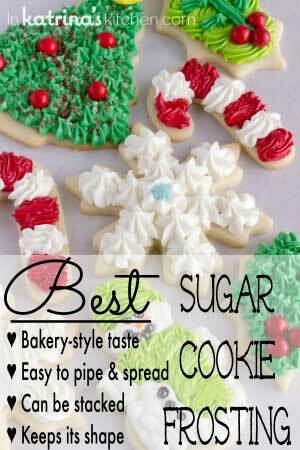 Recipe can be made with or without the glaze. Since I added the Easter candy I halved the glaze recipe. My kids would say (me too) yes give me more please!!! Again fun, delicious and very pretty dessert!!! I KNOW this would be a huge hit at our house. I mean – EPIC…LOL. Well, that’s one way to get rid of the candy…but did you give the brownies away? Because otherwise, the candy is still technically in your house! 😉 Still, makes for a yummy treat that is candy-based but isn’t just plain old boring candy! Anyway, thanks for sharing this! This is genius!! 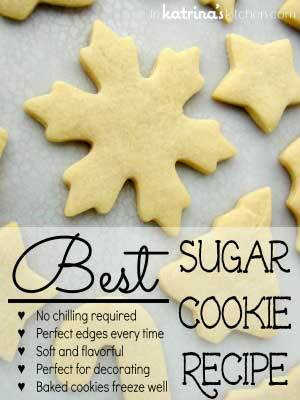 I think I will have to make these on Sunday so my hubby can take them to work! He won’t take in just plain candy, but baked goods with candy…..brilliant! Thanks! I was good this year and didn’t go overboard on the Easter candy like I usually do, but I kinda wish I had now that I see this! 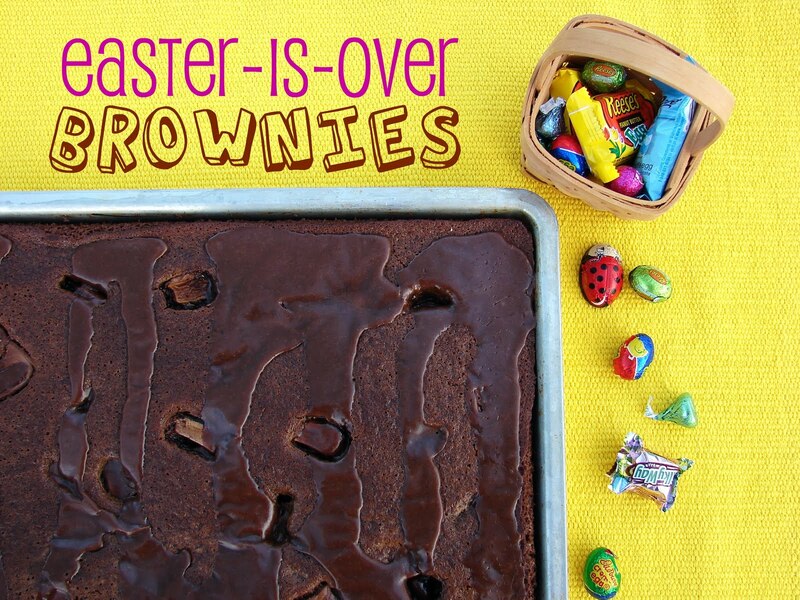 Easter may be over but the part continues with those delicious brownies! Great idea! A friend did something similar. She had leftover Andes candies, the chocolte mints, and when she added them to her brownie batter, they added just the loveliest hint of mint. You great bakers and your clever ideas wow me! So smart…but I don’t think that I could bring myself to give them away! Easter is over? 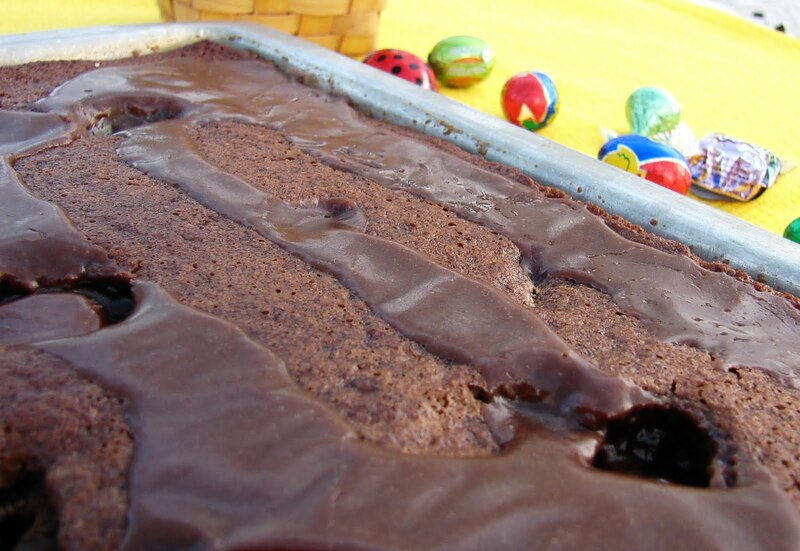 Aww man, I never got any peeps… Brownies are a great idea to get rid of all that extra sweet stuff! I keep seeing coffee added to brownie recipes, I really must give this a try! Hmmm…perhaps this is an interesting and humane way for my creme eggs to meet their end 😉 Thanks for sharing, brilliant recipe! Mmm yummy! I love adding coffee flavor to chocolate treats. It brings out the chocolate flavor so well. 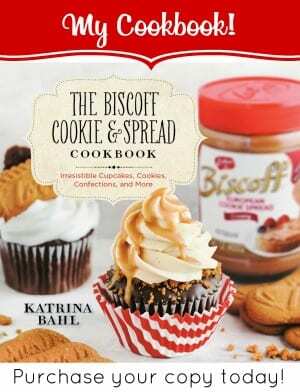 These look so yummy Katrina!! How creative!I don’t have any Easter chocolate since my kids are all grown up,however there’s always some kind of chocolate candy to use instead..Thanks for sharing! I have to admit that your post made me laugh. What a GREAT way to use leftover candy! Decadence upon decadence. And great tip on how to substitute buttermilk. I actually couldn’t find it in the market today for some reason, so I decided to replace it in my recipe with greek yogurt which I have done in the past. 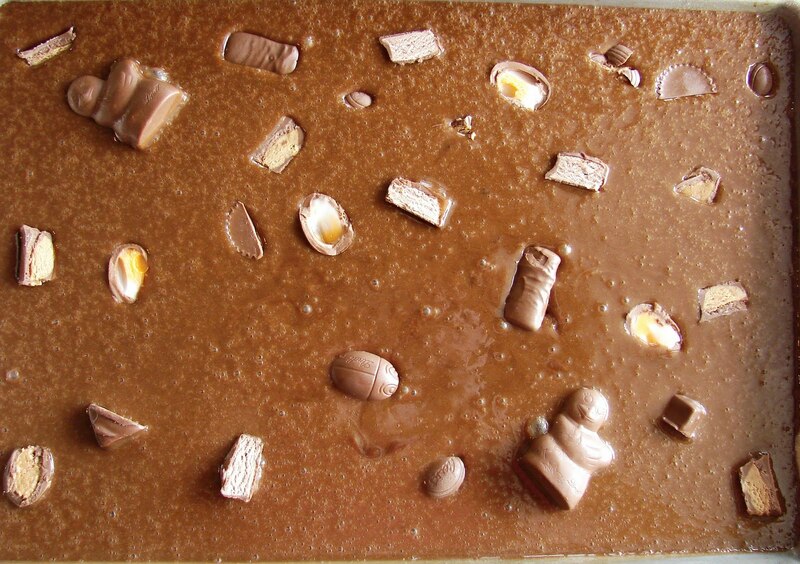 This looks fantastic – like a chocolate swimming pool! I really need a good brownie recipe. It looks like I found it! Wonderful, sneaky way to get that candy used up and out of your temptation. I wish I was one of your kids… I would be the fattest happiest kid on the block! 🙂 Delicious delicious delicious!! Oh my gosh. That just looks deliciously awesome! That looks like a pure chocoholics dream! I’m rarely in the need to get rid of extra chocolate, but if one day I would have too much on my hands this would be a way to go! This looks so gorgeously oozing and delicious. What a great treat! What a creative way to use up all that excess candy! Separately I understood every word but together, being sick of candy, well, at least high quality chocolate, I don’t grok. The cheap stuff most folks buy for Easter or other holiday, yuck. These look awesome, I always need a way to get rid of leftover candy! I love your idea Katrina! I think we need to make this brownies every single candy-related event… I always don’t know what to do with the leftover candies (and surely I won’t my kids to eat all of them)…so my husband would bring them to work. Even though it’s a same thing, I think brownies are very very nice gestures (doesn’t look like a leftover). Brilliant idea! Oh my goodness, this is one decadent dessert! Lovely brownies, Katrina. It may be morning, but these are calling my name! I do the same thing as what you do, I put chopped chocolate bars into the batter to give it a different taste in every bite. I got so sick of all the Easter Candy I dumped in all in the trash. Horrible I know but I couldn’t look at it anymore! the one thing i like about easter is all the candies but once it’s over, i don’t know what do with all that’s left over….lol. 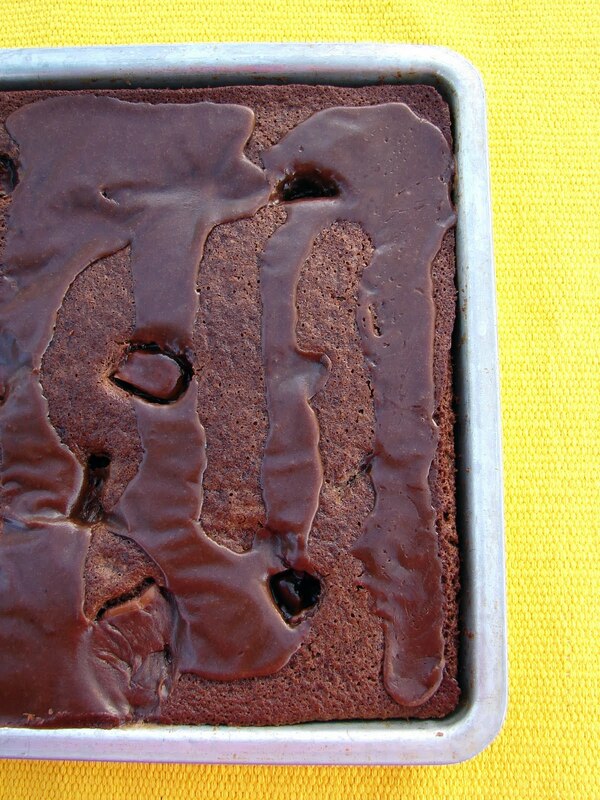 great idea using them in these absolutely drool-worthy brownies! I just put away all the leftover Easter candy in a box in my cupboard. I’m excited to see something I can actually do with it! Awesome Idea! I’ve been taking the Easter candy stash to my store – I thought for sure my customers would gobble it up. Nope. Apparently everyone is candied out! I am 99% sure that I could never be brownied out though. These look tasty. 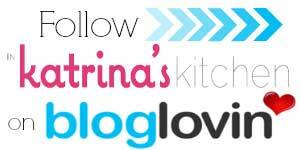 Just found your blog and you are amazing! 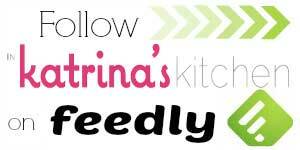 Your eager new follower and would would like to invite you to follow my blog too!